It's time for another video-game caption contest! It should be obvious what to do; you just need to submit a caption for the video-game related image provided, and once the deadline has passed the winner will be determined via a poll. You do not need to put your caption onto the image. One line per caption. We can not place multiple lined entries into polls. Please do not vote for yourself when voting is open. Participation is worth one Caption Contest Participation Point. For every three points you earn, you will receive a Universal Gaming Card. If you win this caption contest, you will not receive a Caption Contest Participation Point as you will have earned a Universal Gaming Card for your victory. The deadline for entries will be April 21st. If you have any further questions, feel free to ask. Also, if you have an image to recommend for a future video-game caption contest, please supply the image to me either within this topic or via a PM. The Captain would rather dive into a sea of Goomba than ever take those smelly pipes the Mario Bros. travel through to get to what he wants. "I can't get wet, my laptop's in my bag!!!" 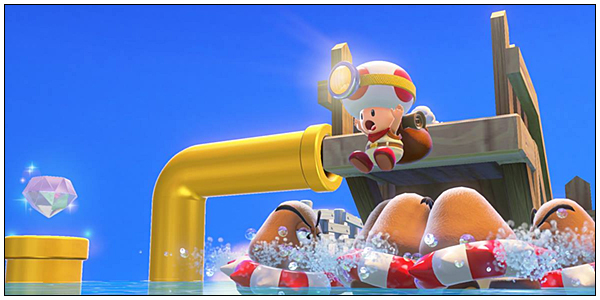 Captain Toad thought it was nothing to jump into Goomba-infested waters...until in that split second he jumped. "No, not the spiked inflatable rings! Anything but them!"